Martin Perry 21st January 2019 21st January 2019 Comments Off on Tennis Psychology: Alexander Zverev – Meltdown! It’s the fourth round of the Australian Open in Melbourne, and Alexander Zverev is under the cosh. One set down to Milos Raonic. the number four seed is faring no better in the second set. When suddenly all his frustrations get the better of him. Four-one down and with his second serve failing him, the German goes into meltdown, and destroys his racquet in an impressive display of systematic destruction! Sometime a racquet smashing interlude can release a lot of pent up frustration and help a player regroup and refocus. Or it can tip them to a point of no return. And so it proves , as Zverev leaves Melbourne a heavy loser. After his ATP final win in London in November, big things were expected of Zverev this season. Surely he could now go on and secure his first Grand Slam title. But expectation brings pressure. And pressure can do strange things to players. It can build up inside of you. Gradually. Simmering away. Press conferences. Newspaper talk. Friends and family. On the tour. Your looked on as the next World Number One. But deep down you don’t like it. You simply want to go out and play. Do things your way.But you sense that everyone is watching. And waiting. Somehow you feel the need to be playing at another level. The level of a Grand Slam winner. The pressure builds, Simmering. Your in the first slam of the season, and suddenly you don’t know how to solve problems. Second serve not working. Thats pretty easy to solve. Normally. But things don’t seem normal anymore. Your mind which was once so clear, is now suffocated with too many thoughts. The pressure reaches boiling point. And it all comes out in a torrent of incandescent rage. You’ve just let the world know how you are feeling. Which is fine if it clear the systems. Clears your head. Snaps you out of the pressure haze. But a meltdown can be very de-stabilising. It can deplete you of energy. Exhaust you of your emotional resources. Leave you with nothing in the tank. Nothing with which to solve problems. Leaving you feeling flat. In high-level sport, pressure accompanies your every step. You can’t avoid it. So you have to absorb it. And the the most reliable way to do that, is to have a very stable process that you can count on every day. A process that keeps your game grounded and based in simple things that enable your key components to work. 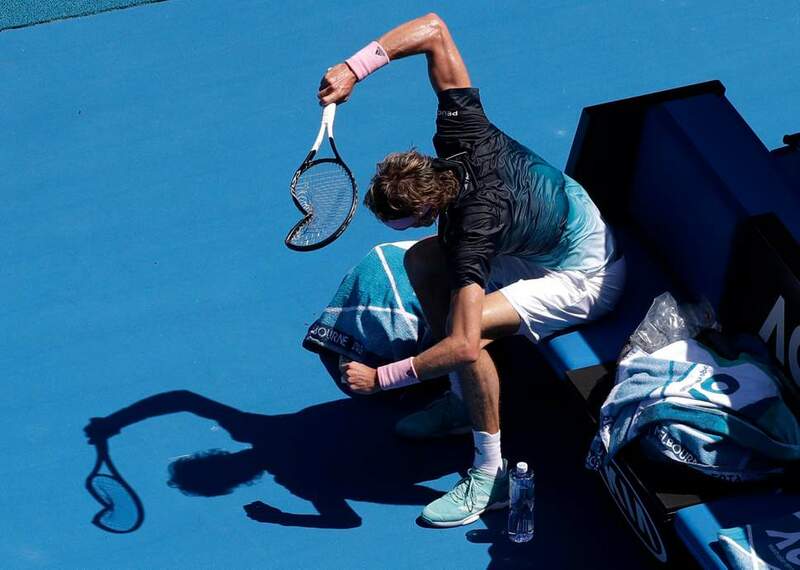 Under pressure in Melbourne, Alexandar Zverev lost connection to his processes. Which means he could no longer solve a basic problem, like an under-performing second serve. When people are looking at you as the next big thing, it’s good to remember it’s because of what you are doing well today. Trust who you are and what has got you to this point. Not some imagined version of yourself as a Grand Slam winner!